Last edited by bmwGTR on 13 Aug 2018 10:32, edited 1 time in total. Please do not quote posts above you. For now, this map contains only Tunisia. Next time, try reading the first post. 1) Is it compatible with PM? 2) Is it just copy-pastes of other areas? 3) It seems to be a comparable size to Ireland at it's current point in development. Honestly this mod seems to be better quality than I initially expected, so ill probably keep it in my main mod load and i'm excited to see where this project goes. 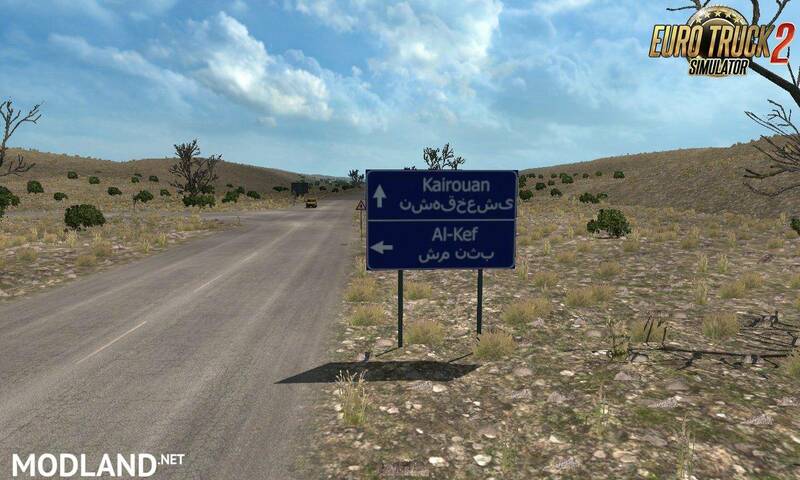 One of my biggest issues with this mod is that these road signs are 1. not accurate to the design of true Tunisian road signs, but are also not in Arabic like they should be. Lots of very pretty country side, the coastal road between سوسة and صفاقس is a beautiful scenic drive, and we finally get a connection to Africa! Cons: Some houses look very out of place like french stone houses and red and white nordic hosues (this may be attributed to the fact that there are no Arabic style house or building assets because SCS hasn't traveled south enough yet), 10-15 frame loss when entering a city, road signs in English as opposed to Arabic, the license plates in Tunsia at the moment are Austrian for some strange reason. At the moment this map is better designed than TSM for sure and I would say is on par with the YKS Trukey map, but certainly not as detailed as ProMods. This map could certainly use some work, but I think it's heading in the right direction, and it's only at the beginning of development so we can expect much more i'm sure. I found a page on "Modland.net" which seems to have a 1.3 version of this map, but it only works with 1.32 beta. I speak a minute amount of Arabic (I've taken an Arabic class for several years) but I know enough to pronounce every word even if i don't know exactly what it means. This would mean that city names are pretty self explanatory, and easy for me to pronounce, yet in this picture above, Kairouan and Al-Kef are represented in Arabic with random letters that are actual non-sense and do not mean anything. In reality Kairouan would be spelled, القيروان, and Al-Kef would be spelled, الكاف. We don't know much about this mod developer at the moment, but it would be safe to say that they is certainly not from the region, but i still do appreciate his/her motivation to improve and expand this mod and this is all the reason more to want to get in touch with this mod developer. No, just leave French and Arabic like in real life. But not fake Arabic like it is now.